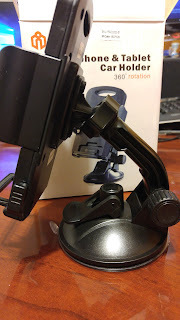 Not that I would ever recommend you use your phone while in a car, but if you needed to use it as a GPS display - or if you're a passenger and wanted to use it hands-free, you'll need a car mount. 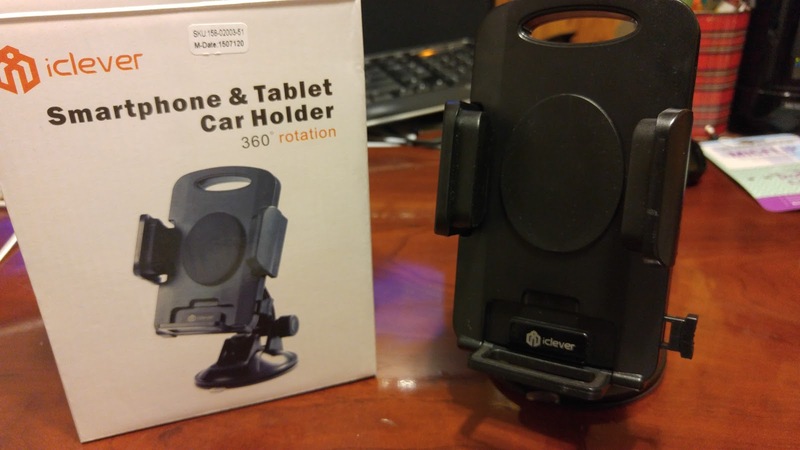 iClever has their ICH02, which claims it's for phones and tablets (but only up to 4.7" wide) and it's only $13CDN. Not a bad price - the last one I reviewed was $30. Now, at $13 you do feel the difference in the build. The arm and ball joint feel pretty 'rickety' and very mechanical. 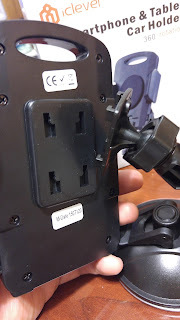 The holder itself isn't attached to the arm, and is just held in place by some slots you feed in, but doesn't lock in. Meaning that if you're on a bit of a rocky road, the holder is likely to bounce out of the slots and could fall onto your car's floor (used to happen to me a lot with older models I had with my Treo). This was obviously done so that you could choose that if you want to flip it upside down (i.e. have the suction on the window vs on a dash... hanging down versus standing up). What is nice is that the 'hugging' holder feels snug, and there is a bottom 'sill' for the phone to rest against (meaning it's not relying solely on the side holders. And the bottom sill has an open slot if you want to connect in your power or headphone (if it's on the bottom). That being said, personally I would opt for something a little more expensive and doesn't seem as slapped together. This feels like the very base model... which is reflected in the price you pay.